Let me preface this review by saying I am already a dedicated follower of Margi Prideaux’ work as an environmentalist and community advocate. 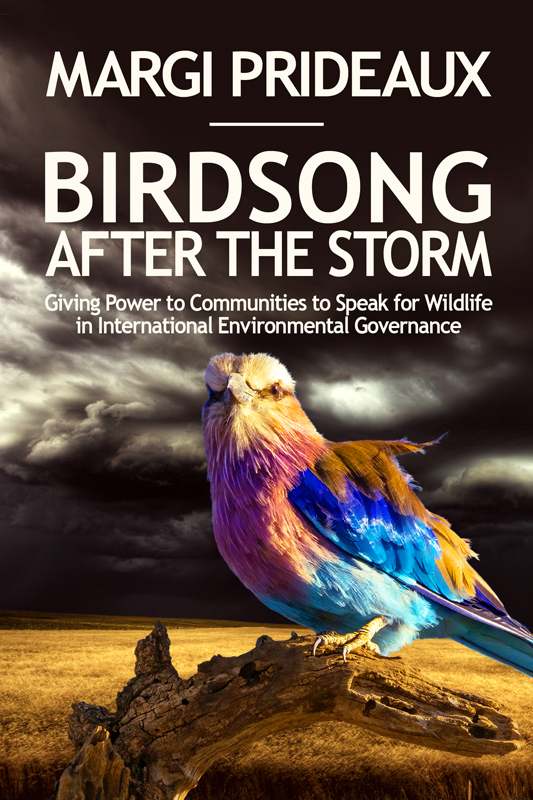 That she has chosen to write this indispensable guide for the future, Birdsong After the Storm: Giving Power to Communities to Speak for Wildlife in International Environmental Governance, combining decades of cutting-edge conservation with an offering of solutions to some of the most pressing problems of our time, not only gives civil society the answers it needs to a future including a non-human world — It offers us hope. At first glance, Birdsong After the Storm looks to be a scholar’s analysis at its core. However, read further and you will discover an assembly of beautifully told stories of people and place: A little blackfaced monkey once considered extinct, now eats fruits from the rainforest because of a grassroots conservation effort in creating local community business programs in exchange for forest protection. An old woman who after 80 years of living in a Spiti Valley village dares to hope she will see a snow leopard, an example of the success seen when a small local NGO and community representatives work closely with government officials. You’ll also read of a manatee and her small dark calf muddling along the lake bed in safety because of an impressive local civil society organization, which represents so much of what is possible for the future. A timely and empowering essay, written by an extraordinary woman. It will stay with you long after you have finished reading. Donna Mulvenna’s writing offers readers a close-up glimpse into the fascinating world within the rainforest, reveals the profound effect it has on each of us and encourages people to form a personal connection with the natural world. It doesn’t make a whole lot of sense to people who are not her kind of wild, but Donna left behind decades of corporate writing to write solely about nature, sport, health, and living simply and sustainably — in essence, her code for living a good life. Today she refuses to own a mobile phone, rarely wears shoes, and is passionate about living on a plant-based diet. When she isn’t writing from her treetop office, swinging in a hammock or reading from a sea kayak somewhere off the coast, she is hurtling along the wild, untamed rivers of the Amazon rainforest in a sprint canoe.